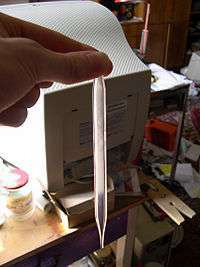 For other uses, see Critical point. In thermodynamics, a critical point (or critical state) is the end point of a phase equilibrium curve. The most prominent example is the liquid-vapor critical point, the end point of the pressure-temperature curve that designates conditions under which a liquid and its vapor can coexist. At the critical point, defined by a critical temperature Tc and a critical pressure pc, phase boundaries vanish. Other examples include the liquid–liquid critical points in mixtures. The liquid-vapor critical point in a pressure–temperature phase diagram is at the high-temperature extreme of the liquid–gas phase boundary. The dotted green line shows the anomalous behavior of water. 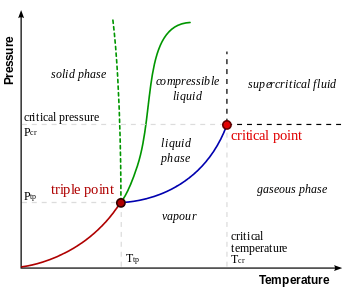 For simplicity and clarity, the generic notion of critical point is best introduced by discussing a specific example, the liquid-vapor critical point. This was the first critical point to be discovered, and it is still the best known and most studied one. The figure to the right shows the schematic PT diagram of a pure substance (as opposed to mixtures, which have additional state variables and richer phase diagrams, discussed below). The commonly known phases solid, liquid and vapor are separated by phase boundaries, i.e. pressure-temperature combinations where two phases can coexist. At the triple point, all three phases can coexist. However, the liquid-vapor boundary terminates in an endpoint at some critical temperature Tc and critical pressure pc. This is the critical point. In water, the critical point occurs at around 647 K (374 °C; 705 °F) and 22.064 MPa (3200 PSIA or 218 atm). In the vicinity of the critical point, the physical properties of the liquid and the vapor change dramatically, with both phases becoming ever more similar. For instance, liquid water under normal conditions is nearly incompressible, has a low thermal expansion coefficient, has a high dielectric constant, and is an excellent solvent for electrolytes. Near the critical point, all these properties change into the exact opposite: water becomes compressible, expandable, a poor dielectric, a bad solvent for electrolytes, and prefers to mix with nonpolar gases and organic molecules. Above the critical point there exists a state of matter that is continuously connected with (can be transformed without phase transition into) both the liquid and the gaseous state. It is called supercritical fluid. The common textbook knowledge that all distinction between liquid and vapor disappears beyond the critical point has been challenged by Fisher and Widom who identified a p,T-line that separates states with different asymptotic statistical properties (Fisher-Widom line). The existence of a critical point was first discovered by Charles Cagniard de la Tour in 1822 and named by Dmitri Mendeleev in 1860 and Thomas Andrews in 1869. Cagniard showed that CO2 could be liquefied at 31 °C at a pressure of 73 atm, but not at a slightly higher temperature, even under pressures as high as 3,000 atm. However, the van der Waals equation, based on a mean field theory, does not hold near the critical point. In particular, it predicts wrong scaling laws. The principle of corresponding states indicates that substances at equal reduced pressures and temperatures have equal reduced volumes. This relationship is approximately true for many substances, but becomes increasingly inaccurate for large values of pr. A plot of typical polymer solution phase behavior including two critical points: an LCST and a UCST. The liquid–liquid critical point of a solution, which occurs at the critical solution temperature, occurs at the limit of the two-phase region of the phase diagram. In other words, it is the point at which an infinitesimal change in some thermodynamic variable (such as temperature or pressure) will lead to separation of the mixture into two distinct liquid phases, as shown in the polymer–solvent phase diagram to the right. Two types of liquid–liquid critical points are the upper critical solution temperature (UCST), which is the hottest point at which cooling will induce phase separation, and the lower critical solution temperature (LCST), which is the coldest point at which heating will induce phase separation. 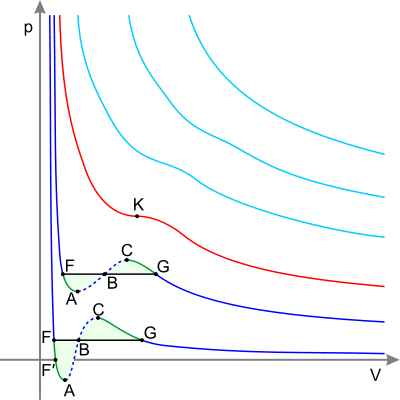 From a theoretical standpoint, the liquid–liquid critical point represents the temperature-concentration extremum of the spinodal curve (as can be seen in the figure to the right). 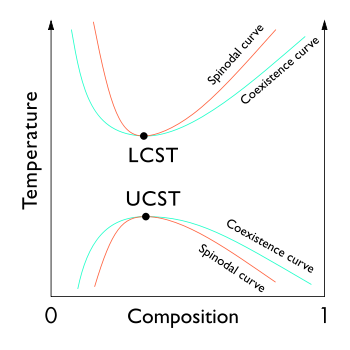 Thus, the liquid–liquid critical point in a two-component system must satisfy two conditions: the condition of the spinodal curve (the second derivative of the free energy with respect to concentration must equal zero), and the extremum condition (the third derivative of the free energy with respect to concentration must also equal zero or the derivative of the spinodal temperature with respect to concentration must equal zero). The critical point is described by a conformal field theory. According to the renormalization group theory, the defining property of criticality is that the characteristic length scale of the structure of the physical system, also known as the correlation length ξ, becomes infinite. This can happen along critical lines in phase space. This effect is the cause of the critical opalescence that can be observed as binary fluid mixture approaches its liquid–liquid critical point. In systems in equilibrium, the critical point is reached only by precisely tuning a control parameter. However, in some non-equilibrium systems, the critical point is an attractor of the dynamics in a manner that is robust with respect to system parameters, a phenomenon referred to as self-organized criticality. ↑ Horstmann, Sven (2000). 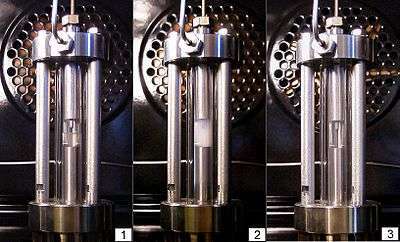 Theoretische und experimentelle Untersuchungen zum Hochdruckphasengleichgewichtsverhalten fluider Stoffgemische für die Erweiterung der PSRK-Gruppenbeitragszustandsgleichung [Theoretical and experimental investigations of the high-pressure phase equilibrium behavior of fluid mixtures for the expansion of the PSRK group contribution equation of state] (Ph.D.) (in German). Carl-von-Ossietzky Universität Oldenburg. ISBN 3-8265-7829-5. 1 2 International Association for the Properties of Water and Steam, 2007. ↑ Anisimov, Sengers, Levelt Sengers (2004): Near-critical behavior of acquous systems. Chapter 2 in Aqueous System at Elevated Temperatures and Pressures Palmer et al, eds. Elsevier. ↑ Charles Cagniard de la Tour (1822) "Exposé de quelques résultats obtenu par l'action combinée de la chaleur et de la compression sur certains liquides, tels que l'eau, l'alcool, l'éther sulfurique et l'essence de pétrole rectifiée" (Presentation of some results obtained by the combined action of heat and compression on certain liquids, such as water, alcohol, sulfuric ether [i.e., diethyl ether], and distilled petroleum spirit), Annales de chimie et de physique, 21 : 127-132. ↑ Berche, B., Henkel, M., Kenna, R (2009) Critical phenomena: 150 years since Cagniard de la Tour. Journal of Physical Studies 13 (3) , pp. 3001-1-3001-4. ↑ Andrews, Thomas (1869) "The Bakerian lecture: On the continuity of the gaseous and liquid states of matter" Philosophical Transactions of the Royal Society (London), 159, 575-590; the term "critical point" appears on page 588. ↑ Cengel, Yunus A.; Boles, Michael A. (2002). Thermodynamics: an engineering approach. Boston: McGraw-Hill. pp. 91–93. ISBN 0-07-121688-X. ↑ Emsley, John (1991). The Elements ((Second Edition) ed.). Oxford University Press. ISBN 0-19-855818-X. ↑ Cengel, Yunus A.; Boles, Michael A. (2002). Thermodynamics: An Engineering Approach ((Fourth Edition) ed.). McGraw-Hill. p. 824. ISBN 0-07-238332-1. ↑ "Critical Temperature and Pressure". Purdue University. Retrieved 2006-12-19. ↑ Christensen, Kim; Moloney, Nicholas R. (2005). Complexity and Criticality. Imperial College Press. pp. Chapter 3. ISBN 1-86094-504-X. "Revised Release on the IAPWS Industrial Formulation 1997 for the Thermodynamic Properties of Water and Steam" (PDF). International Association for the Properties of Water and Steam. August 2007. Retrieved 2009-06-09. "Critical points for some common solvents". ProSciTech. Archived from the original on 2008-01-31.